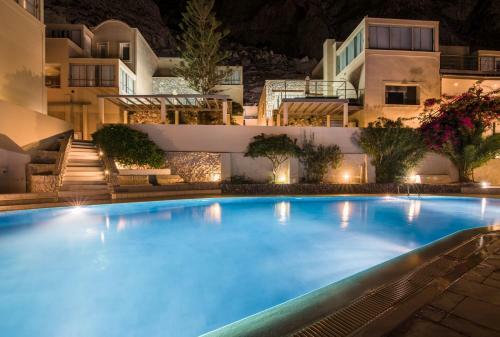 Antinea Suites Hotel & Spa is 4-star hotel located in Kamari, Santorini. The hotel offers to its guests restaurant (a la carte), restaurant (buffet), restaurant, hammam, pool bar, bar, garden	and outdoor pool. Especially for the kids the hotel provides kid meals. The property offers family room, junior suite, honeymoon suite, maisonette and other might be available upon request. Amenities of the rooms include air-conditioning, heating and more. Antinea Suites Hotel & Spa does not accept pets. Fields with * are required. The enquiry is sent directly to Antinea Suites Hotel & Spa.